These are actual comments submitted by past clients that I had the pleasure to perform for. I am overwhelmingly proud to display them here. -"When I was first on the market for an Elvis Impersonator, Jeff immediately jumped out at me as the best performer. After Jeff came to my event and performed, I realized he may be one of the best Elvis Impersonators world wide. And to my understanding, there are 40,000 Elvis Impersonators world wide. From the very first phone call all the way up to the performance, Jeff was professional and reliable. At the event, he blew all my guests away with his unbelievable voice and stage presence. We all thought Elvis was in the room, as it was a standing room only. The party became electrified. We all had the best time. More importantly, it was Tony's Birthday, and Tony will remember this Birthday forever. I would hire Jeff again in a heartbeat. Thanks Jeff for the Best. There is no other. Sincerely, Mike B." ***** - "JEFF IS ELVIS! Everyone believed. When Elvis entered the room, the screaming began. These were adults in their 20s, in their 40s, and Elviss peers. He sang, he posed, he shook, he filled the memories on our cameras and our minds, He thanked us very much. Is Jeff the best in Vegas? Wed bet on it. Hes the greatest entertainment. Our guests couldnt believe we found the best. Thank you, Jeff, for such a memorable wedding reception for Aly and Clint and our 100 guests!" - Kelly L.
- "WHAT SETS JEFF APART FROM OTHER PERFORMERS, ASIDE FROM HIS INCREDIBLE VOICE, IS HIS GENUINE SINCERITY AND PASSION HE PUTS INTO HIS PERFORMANCE. HE SEEMS TO HAVE A DRIVING DESIRE TO MAKE THE AUDIENCE HAPPY AS ELVIS ALWAYS DID. IN ADDITION, JEFF'S INTERACTIONS AND PHOTO OPS WITH GUESTS FOLLOWING HIS PERFORMANCE IS ASTONINISHING! HE IS ALMOST A 'STUDENT' OF ELVIS, KNOWING EVERY FACT THERE IS TO KNOW. WHAT A GREAT EXPERIENCE! 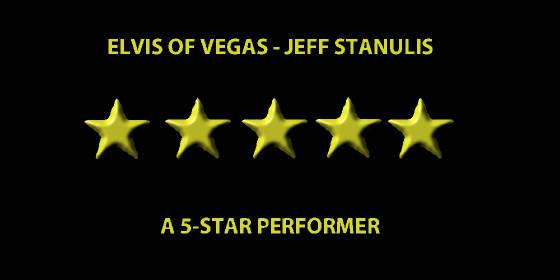 JEFF TRULY KEEPS THE ELVIS LEGACY ALIVE IN A FUN, PROFESSIONAL, AND INCREDIBLY AUTHENTIC TRIBUTE" - Barbara B.
I personally felt that your performance was first class and the way you made the party feel can only be thanked in words, but I wish I was there to embrace you and buy you a beer or two. You were also an honorable credit to the name of Elvis himself and in no way did him or his memory any negative harm in any way.